Ten great games and eight great teams from the zenith of Michael Jordan's career were not enough. NBA 2K11 will feature a singleplayer mode allowing you to take the game's greatest superstar into today's league - if you're good enough. 2K Sports today revealed that "MJ: Creating A Legend," a special singleplayer mode that will unlock once all 10 goals in "The Jordan Challenge" are met. 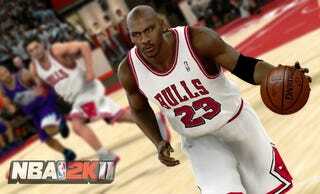 When the mode is available, Jordan becomes available as a performer in the "My Player" mode introduced with last year's NBA 2K10. But he won't be an all-star from day one. He begins with a 79 overall rating, and your goal is to make him the greatest ever - within today's league. Whether you can't bear to see No. 23 on any team other than the Chicago Bulls, or if you want to see him on the Golden State Warriors, the Portland Trail Blazers - team that should have drafted him - or the team he owns, the Charlotte Bobcats, it's all there for you. But there's a catch - to get to "Creating a Legend," you'll have to beat all 10 marks posed by "The Jordan Challenge," which recreates 10 of Jordan's most electrifying moments, with period-authentic rosters and visuals. That means you'll have to drop 69 points on Cleveland, 35 points and six threes in one half on Portland, and the famous Double Nickel on the Knicks in 1995. Given Jordan's popularity, why not make this mode available to all players, without unlocking it? "Any professional athlete's road to greatness is filled with obstacles and challenges," 2K Sports vice president Jason Argent told Kotaku. "We didn't want to hand something over on a silver platter, because frankly, nothing was handed to any great athlete on a silver platter. We felt this was the best way to reward someone for completing 10 amazing achievements." NBA 2K11 producer Erick Boenisch, speaking to ESPN (which first revealed this new mode), said that Jordan's career mode will begin with a substantial physical skill set, but one that "lacks a lot of the shooting skills and the offensive and defensive awareness. "So you're playing with a raw prospect who can do just about anything, but can't deliver in the clutch just yet," Boenisch said. It'll be your job to take him from a 79 rating to a 99. But Jordan is insertable into any NBA roster in current times. If you want to right a wrong in Cleveland, replace LeBron with him. Or send No. 23 to Miami for an even more insane starting lineup. The only limitation is that Jordan, on a team in today's league, is playable only in singleplayer. Jordan's skills and ratings arent; the only features that will see progression. Boenisch told ESPN: "When you start out as a rookie, you're going to start out with the short fade, the short little hair. Then as he gets older you're going to see him go with the bald look, then the mustache in the middle years, and his body will bulk up a little bit as he slowly becomes the older Jordan." He'll be playable up to about age 40, the same as in real life. Given Jordan's popularity, and persistent relevance to today's fans, despite retiring eight years ago, I wondered if it was risky to put this kind of a game mode behind an unlockable wall that, for some, will be difficult to crack. It's only appropriate, Argent told me. "We want to reward people for completing the Jordan challenge, it's as simple as that," Argent said. "We are a sports brand and any man or woman that has played competitive sports or enjoys competitive sports games knows nothing is handed to you, and ultimate respect is earned through hard work and winning. MJ: Creating a Legend is a great example of this."